I bring this up because the sensation of flying in Boeing-747 feels a lot more unreal than does flying in a plane like the tin shoebox I flew between islands this weekend. I don’t mean to say I was frightened by the flight—in fact it was exhilarating—but the exhilaration of the tiny plane and the terror in the freefall bungee jump is that feeling of undeniable reality. When you check in for the interisland flight, in addition to weighing your luggage, they weigh you. The plane is small enough that passengers are assigned seats based on keeping the airplane balanced. On both flights, I was relatively smaller than just about all the other passengers, and was thus assigned to the front row on both flights. There’s no door separating the passengers from the pilots, and I had to turn up my iPod so I could hear it over the hum of the propeller outside my window. 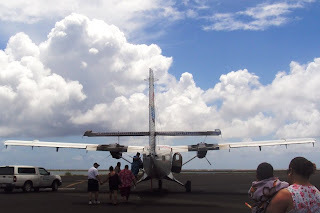 Going from 747 to tiny island hopper is somewhat akin to going from lavish charter bus to Volkswagen Beetle; you become a lot more aware of the driver and the road. You feel the turbulence. You feel the landing. 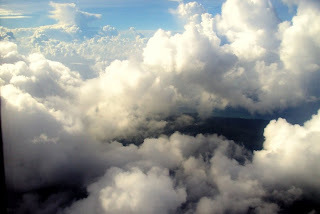 But then again, for most of the flight, you feel like you’re floating in the clouds. Yes, it’s always fun to fly through the clouds on an airplane, but when you’re flying in a little aluminum can, it’s a different a different sensation all together. When you can see out both sides and through the windshield, it feels like you’re riding a Dodge minivan through the sky. The trip is very short, so the cruising altitude is relatively low. The buildings never get too tiny. 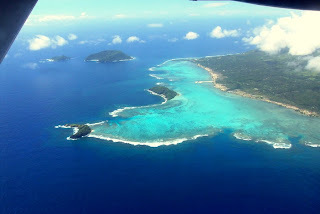 And especially given my familiarity with Upolu after 14 months, landmarks are pretty recognizable. So in addition to the soaring shoebox feel, the relative scale of things is never too far away. The feeling is buoyant and weightless and dreamlike. 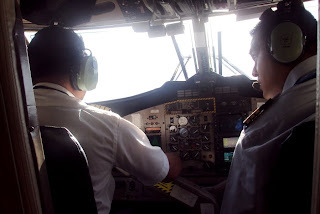 When we touched down, it seemed like the destination was a bonus; the exhilaration of the flight itself almost seemed worth the price of the ticket. The return-flight plane. Dustin, what kind of plane is this? No zoom. Maybe a lateral arm reach. I took this picture from my seat. 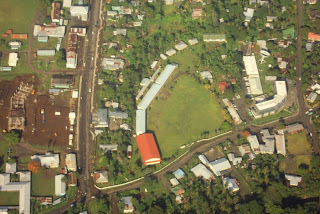 The southeastern corner of Upolu. I don't think the water used to be as light before the tsunami hit. I'm pretty sure it's all white sand along the coast because the tsunami dragged so much top soil away. We were flying low enough that my school was very easy to pick out. 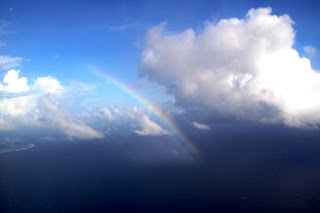 There was a rainbow over the ocean. "it feels like you’re riding a Dodge minivan through the sky." What a great line! Great post Matt! you have some great pictures from the air. Hoped you smoked the LSAT! I know this is moot point, but I wanted to go back and read your blog when you first started. I'm on Novemmber of 2009. It was all fine until now(November). Instead of November, it's December. Did I miss all of the November blog?? ?